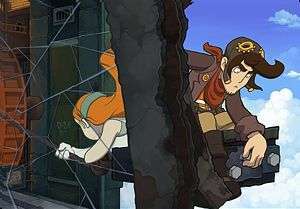 With the Deponia series finally drawing to an end, I grabbed hold of the Daedalic wunderkind ‘Poki’, the creator of both Deponia and the Edna & Harvey series, with a view to grilling him on the long-awaited final chapter, whether he could put up with two clones of himself, and why the entire series is just an extended metaphor. 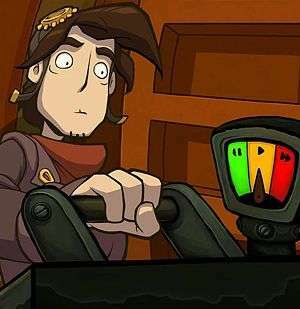 As ‘Goodbye Deponia’ is the third entry in the series, how did you use Chaos on Deponia as the springboard to writing this final chapter? First I have to say that originally, a couple of years ago now, when I came up with the idea of Deponia I had the mind to make one single, big game called Deponia, but they made the mistake of giving me a year to come up with the concept, and when they let me out of the cellar I had collected so many ideas it was really impossible to fit all of them into one single game. So we had to split up the puzzle designs into all three parts when we started production of the first game. 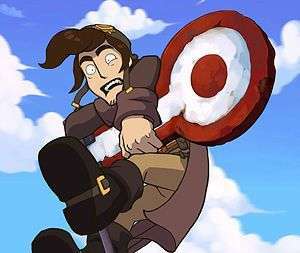 But of course, as things tend to do, Deponia evolved quite quickly; we had to re-design the game a little bit because we wanted every single part to be playable on their own, inserted endings that had to have little cliffhangers tied to them because the whole story of Deponia didn’t come to an end, we introduced characters to the world and it was in the production phase that I wrote all the dialogue for the characters. More and more the focus on the game shifted a little bit, some of them became more important, for example it was clear to me after the first part to give Rufus’ ex-girlfriend Toni a bigger role in the second and third part, because she was just so important to the story and such an important attitude to wrap some of Rufus’… special character traits against. I just needed this character more in the game, so we included her in the second part as well. When I wrote the first two games more and more threads were visible than I first anticipated that were important for the story, so I had more open threads at the end of the second story to knot together in the third part. This time around I took half a year again to re-design the third part of Deponia because I recognised that okay, the second part of Deponia, I was really proud of that, I was very proud of what we did there. Still, I wanted the third part to be better than the second part, so I had to go into this re-design phase, and make more in the third part than I did in the parts before. Luckily I can say now that we achieved that, we re-designed all the puzzles in the game so again like in the first two parts we had two bigger chapters surrounding smaller chapters. In the first part we had mainly one big chapter, and in the end chapter one was so big we had three chapters in all. So, the second part was already four chapters, two bigger parts and one of those was gigantic; the Floating Black Market was a huge location where you can really freely take your time to go around and take your own tempo with which you wanted to solve the puzzles. We had multiple tasks at one time as well, and that’s something I wanted to echo in the third part as well, as in the original design there was one such big part, so I had to include that in the third one as well, and I think we found a brilliant way to do that which was fitting not only with the other two parts but also what I had in mind with what I wanted to do with the third part. It was a lot of effort we put in there, but in my opinion we really succeeded, and maybe even went over the top a little there, because there are so many new crazy ideas in the third part, my own feeling playing the third game, it really feels as if you are playing two Deponia parts in a row because there’s so much craziness going on! Different from the second part – there’s a lot more story wise going on – but you still get a lot of time to enjoy the Deponia madness, and that’s something that was quite important to me. Was having three versions of Rufus always planned to be in the third part, or did you say after Chaos “Okay, we’ve got to go bigger!”? Actually, it wasn’t planned for the third part. The whole topic of that, that there is cloning going on in Deponia was already written in the first version of the story, but we never used that, and so I was very glad when I found out, so this is exactly the one point that solves my problem of getting the third part bigger, echoing the special game mechanic we had in the second part, where you had to switch between Goal’s different character facets. I wanted something like that in the third part as well, and it gives a very unique gameplay experience that we a very complex, big chapter in the game, where you’re split into three parts with three Rufuses, that doesn’t take out the tempo, because we’re building up to the end and there is the time pressure of “okay, you really have to go to the ascension point to leave Deponia to go to Elysium to say to the Elysium elders that there is still life on Deponia and save the day”. This time pressure, my first approach was to make the last part of the game quite linear so you feel the time pressure, but it contradicted my idea to have a complex, broad part like the Floating Black Market. So the idea of cloning and having each of the single Rufuses have a fast-paced sub-chapter, but to intertwine these with each other, so it’s just as complex as the Floating Black Market and as many locations to discover was exactly the idea I needed. It makes total sense and makes for some very brilliant new moments between the Rufuses, especially the part where these three threads of the story come together again, feels very important for the end of a trilogy. It’s a multi-threaded ending like the end of Star Wars or Lord of the Rings or the Matrix even, that you have different groups of characters, of main characters that work on different locations but towards the same goal, and it feels even more special because you are constantly taking part and you are the one who knots them together, and it’s quite an experience. One of my favourite things about Chaos on Deponia was that you had to work between Goal’s three different personalities, but in a way I prefer the idea of having to work with the same three personalities, just in different bodies. Was that a challenge to write, seeing as you had to use the same voice three times over? We had to find some ways to let them have all have their own area where they can roam around, but still have this interactivity between them. That was quite a puzzle for me myself to solve, but besides that it was even helping the story because you can say a lot of things about Rufus, but one major thing is that he really completely lacks self-reflection. He doesn’t reflect on his actions, and to be confronted with another Rufus really has to bring that out, because they should assist each other and help each other because they have the same goal and really need to help each other, but more of the time they are blocking each other’s way and repelling each other and it’s quite funny, it makes for many very funny moments in the game, and of course for some mix-ups. It was something I intended from the beginning with my Deponia story that I wanted Deponia to be some kind of comedy of errors, where all these mix-ups happen, and we’ve already had some of these elements in the first two parts, but what really was interesting for me was to make the mix-ups really playable; we had quite a few in the first two games and now it comes really to the extreme. I really do think these motifs of the mix-up comedy comes up a lot in the third part and it’s really a lot of fun to be involved in them, to play them and be part of that. So, Rufus is a doppelgänger of Cletus, we know that from the first two parts, but to sneak past a corridor in the same moment Cletus comes from another direction and they just look the same because Rufus is dressed the same as him, and these are such strong moments that they’re really fun to play as well. We even have a couple of mini-games that depend on this comedy of error motif, like you’re hiding a bathroom mirror of Cletus and you have to make him unconscious for some reason, and you just remove the mirror and you play as his mirror. You have a mini-game where you have to brush your teeth in the same way he does, because otherwise he goes “Huh? What’s happening there?” and then you have to pick it up and mimic his movements, and that’s just one of many moments. There’s another one where Rufus has to give a speech disguised as Argus, and he steps in front of a big audience of Organon soldiers who are just waiting for Argus to give his big last speech, so you in the role of Rufus have to imitate Argus by choosing the right dialogue options, but when you are through – which is funny enough because Rufus really gets into the role – afterwards he has to sing the Organon hymn. Then there’s another part where he’s disguised as an Organon medic and he has to perform an operation. There are a lot of parts like that, there’s another where there’s a long hallway and characters are chasing each other through many doors, but each of these moments are really hilarious and I really enjoyed working out how we can really play them and not just watch them, but be part of them. Another one of my favourite parts of the series is just the fact that Rufus never changes, you get to the end of the first game, then start the second one and there’s the scene where people are insisting you’ve changed while you’re just causing havoc. But, I also really like how Goal’s changed, especially during the second part, but now she’s a baby! Yeah, it was quite an interesting way to show her character by breaking it into parts, so you can really look into single facets of her, and now in the third game she’s all put together, you can enjoy “Okay, is this a Lady Goal part, is this a Baby Goal part or is this a Spunky Goal part?” and it’s really fun to see them being united again. I think it’s a very interesting way to get to know somebody, but I wouldn’t recommend you do that to your girlfriend. [Leaning in up-close to the microphone] Do not do that at home! That’s what really appealed to me about the story of Chaos on Deponia; I always saw it more as what Rufus and Goal would have to personally and emotionally overcome before they could be together. On the other hand, do you think you could cope with three copies of yourself running around? [Laughs] I don’t think that would be a good idea in many ways. It’s really a shame to say that, because Rufus is such a useless moron that in many ways, but there quite a few of my own character traits in his character. When I started Deponia it was more like I went to court for these character traits, I had to be the advocate for these personalities and get myself free for them, and it still feels like that, where the third Deponia part is still the same, and that’s my main source of inspiration; I really wanted these conflicts as personal as possible, easy to understand conflicts that we all carry around with us that need to be revealed. The whole planet and the whole situation on Deponia is nothing more than a metaphor in a way for these character traits. Are you planning on inserting yourself into the game like you did in Edna & Harvey: The Breakout or in Chaos on Deponia, or will you just be there for the singer/songwriter moments between chapters? It’s just the singer/songwriter moments. I included myself as the gondolier in the second part and he’s dead now [laughs], so there wasn’t space to include myself again, but I am doing those songs between chapters, and now we have two more chapters than we did in Chaos, I have two more songs than I had in the second part, so it’ll be seven times that you can hear my voice in the game. I sung for the English version as well, which was an experiment of course, being a game that hovers from topics mostly around egotisms, it just felt right to include myself in this way, so I’m glad that I do the English version on my own as well. I’ve heard the Spanish versions of the songs as well, that I didn’t do myself, and they’re quite hilarious to listen to. I don’t understand a single word of Spanish, but it’s quite fun to hear that! As a writer of comedy games, do you find it really difficult to make sure that the jokes work in English? That’s a very big threat, humour is such a precise work; it depends on everything – timing, where the key words are in a sentence, if they’re at the end or at the beginning… I can be very, very precise in my own language, and in the English version I can’t do that on my own, so you need very good translators to help you there. In the past we’ve had some translations for games that didn’t really live up to the original and it was a huge problem. It will always be a huge problem, but I guess from what I’ve heard and my own sense when I play the English version of the game, is that the translators do a really great job, and they sometimes take other turns or approaches to a joke to get the same feeling of the original game. We have a great team working on that, and I’m still co-voicing and co-directing the English voice acting. When you write the games, do you do the story and dialogue at the same time as the puzzles, or do you do the puzzles from A to B and write in the jokes afterwards? It’s more intertwined, you need to develop the story and the puzzles in parallel, you use to use the interactivity of the medium, you really need to tell the story during the gameplay, and you really have to make sure that every puzzle is in a way an aspect of the conflict of the game, and of Rufus’ development. My approach to writing a story is to first make a rough overview of the whole story, then I split that up into parts, then I take these parts and split them up into situations, then I go into the situations, and at the end I’m going sentence for sentence, to make sure every word is in position. It’s the same for the animation, you have every single click be part of the story, and it’s quite an important thing for me. 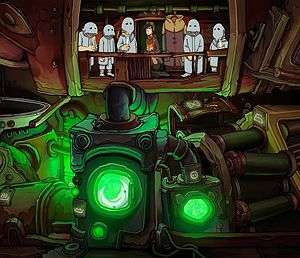 With all the puzzles that require interactivity between the different Rufuses, did they take a while to come together, or was it a natural process after the similar dynamic in Chaos on Deponia? [Laughs] It makes your brain somewhat strange when you write puzzles, because you want to surprise yourself, otherwise you don’t know if you’re really surprising the player, so you have to find a way to write things that surprise yourself all the time. It’s even more complicated when you have to take into account that there are three Rufuses who can interact with each other and have to work on their own at the same time. It’s a strange thing to do, because you always have to switch perspectives on every single moment of the game and you have to take into account whether it has the same feel to it if the player chooses to do it now or if they switch to another Rufus and come back later. There are many more things to take into account to make sure a situation really works, but I think it works quite well, surprisingly so. At the end, it really comes together. It’s like Deponia itself is functioning, it’s patch-work, out of small pieces, put together in a strange order. It’s the same for the story; it’s a space-opera that’s connected to a romance that’s connected to a slap-stick comedy. It’s all some crazy patch-work of things you like, and the same goes for the puzzles as well. Is it going to be sad leaving the world of Deponia behind? Definitely; when I wrote the last song, I was very nearly crying when I wrote the words. 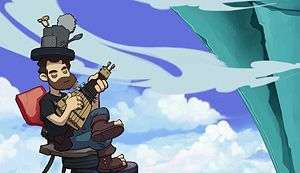 It’s quite a step to leave these characters and this world behind, and as you know those songs aren’t taking place within the same time and space as the game itself, he’s telling the story of Deponia as if it was just a metaphor for something else, and so the last song brings you out of the story and there are some very moving emotional moments in that last song, not just for myself, even if it’s just forty seconds or so. There are very emotional moments where you realise “oh, this is really the end of the story”, and now we’ve all lived through it, that’s a really big adventure we’ve all lived through, but it’s nothing more than a memory now. It’s really embarrassing, but it really brought tears to my own eyes to write this song, and afterwards to sing it. Difficult, but it’s a sad thing. So what are you doing when Deponia’s over; are you going to take a break, or are you already planning on launching yourself into the next piece of work? It’s like the game is some kind of metaphor! [Laughs] Definitely. I hope I get my mind wrapped around something soon after Deponia, and I’m looking forward to that. There are already so many ideas, and I have to do my best to suppress them, because my focus and attention are on the last few weeks of ‘Goodbye Deponia’, polishing it and removing the last bugs. Yeah, I cannot afford now to already concentrate on something new, but my fingers are tingling to write something new, something else!